We’re all set for the world premier next week, which is extremely exciting for us, considering that we’ve been working on iSundae II for more than two years. Pre-screenings have had quite good responses to the film, meaning the funny parts drew laughter. 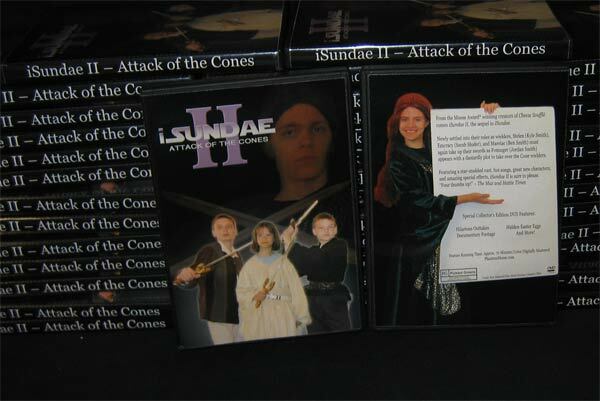 But anyway, here are some pictures of the initial 40 copies of iSundae II. Obviously, I’m thrilled, although I’m a bit tired of punching out DVD cover inserts. While I’m here, I’ll mention how I do DVDs. I prefer to use the punch out DVD inserts, since the only paper cutter I have access to is in pretty poor condition. Designing of the inserts happens in Apple’s Pages, which is new for this movie release. Previously I had used some other software that I decidedly disliked. The disc art is designed in Discus RE, which is the previously mentioned disliked software. When I find something to replace this, I will be very pleased. Generally, we use Photoshop to create the design, and then Discus is used as the print driver for an Epson Stylus Photo RX580, which prints directly on the discs, giving a more professional feel. Label kits are fine, too, but I prefer printing on the disc. After all the designs have been printed, it’s time to assemble. We’re on a budget here, so I put each DVD copy together by hand. Hey, it’s the personal touch! 🙂 Once I get going, I can average about one complete DVD assembly per minute, depending on what’s being played on the other computers in the room. I have never done any of the little booklets that you see inside of professional DVD cases. The only thing that I could ever put on them is the scene selection. So I figure that I can save some money on ink that way. We’re on a budget, remember? So that’s how I do DVDs. Generally, I’m pleased with the results. 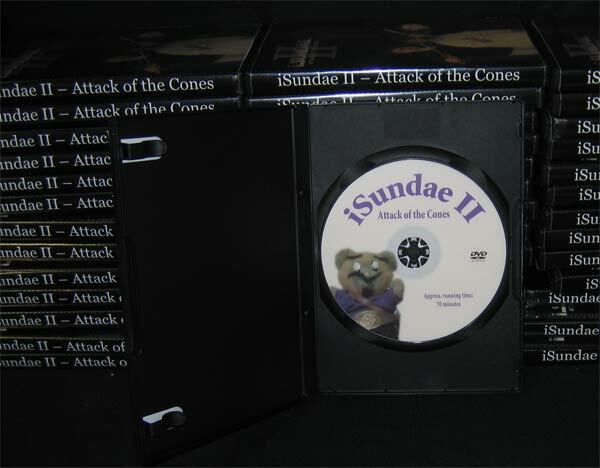 This entry was posted in Blog, DVDs, Movies and tagged disc art, dvd, isundae ii, movie. Bookmark the permalink. you must send me a copy! I’ve been waiting forever. hurry!